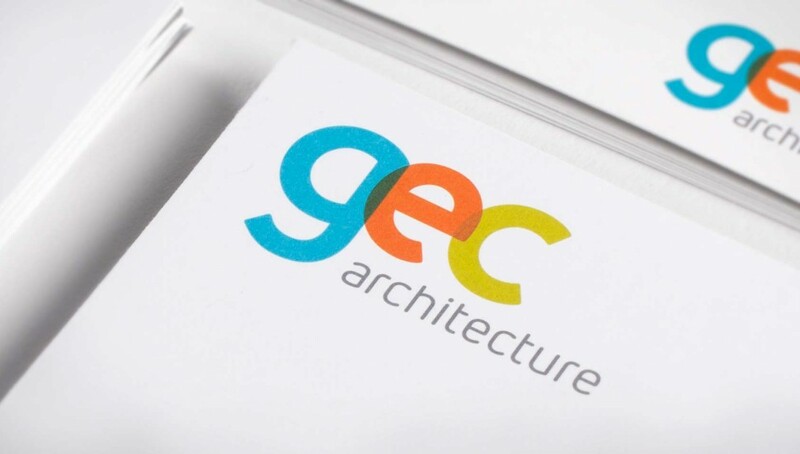 GEC Architecture decided the time was right to address two important components of their business: their logo, and how they talk about themselves—their brand expression. To us, these things go hand-in-hand. Without due consideration to the underlying strategies and business objectives, it’s difficult, if not impossible, to evolve or create a new identity that is effective and has any real meaning. Without strategy, any chance that the new brand will last is also just left to chance. In digging deeply with our process, and involving the partners and key staff at GEC from the start, we were able to bring order and consensus to the project. In our experience, this is often what firms with multiple partners find the most frustrating part of creating new outward expressions of themselves—agreement. 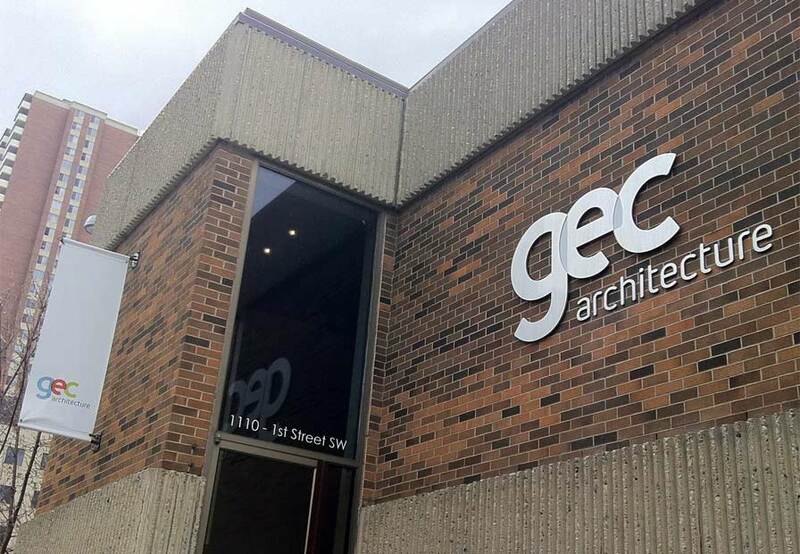 GEC Architecture is an established, Calgary-based firm with a rich history. The work they do represents a depth of knowledge and inherent philosophy that has tangible implications for their studio and their clients. Despite this, even those who know the firm well often had trouble expressing what it is that makes GEC unique, and the right choice for a given project. A name change was also up for consideration. The trend, for professional service firms, has seen firms moving away from a collection of partner names to acronyms and more abstract/corporate names. Equity and familiarity issues must be considered, especially if those partners with their names on the door are still closely involved. However, unless a firm is committed to a name change every five to 10 years as partners change, succession planning is an important consideration, and having a name that can transcend individuals is a very viable option. In this case, we established that the name would remain as is. 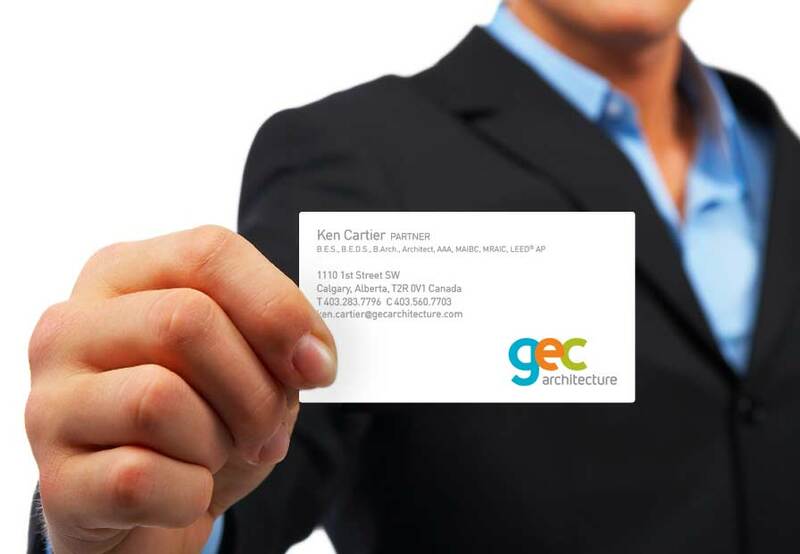 Following this, our first task was to help GEC find a way to deliver their message clearly, concisely, and compellingly. We did this with words rather than design, finding stories within their verbal and written expressions of the company. 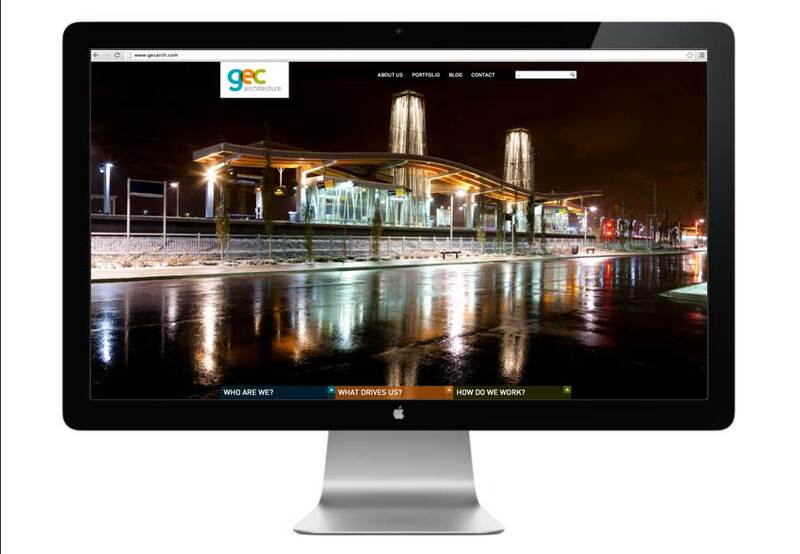 From this, we had the basis to communicate GEC’s uniqueness and brand attributes, and a solid platform for the visual design. 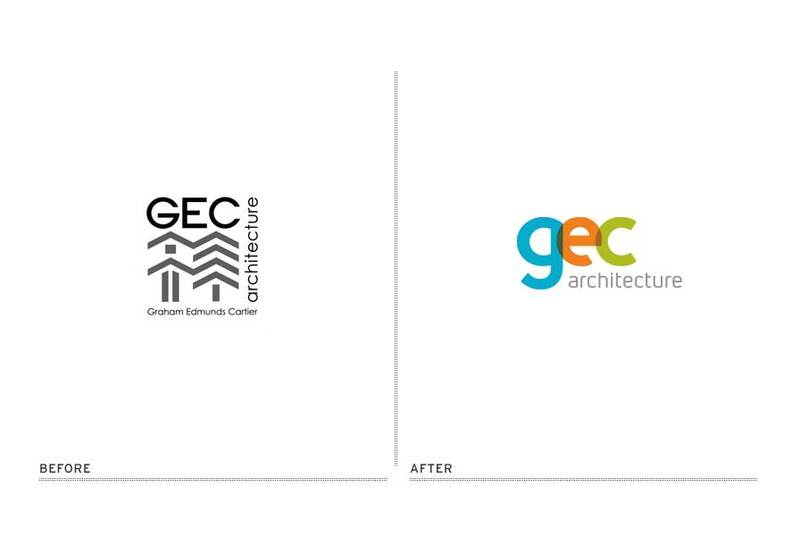 The new GEC logo is based on what we call The GEC Way: context, leadership, and innovation. Together these guiding principles provide a unique perspective and drive the firm to advance (the practice, their people, the work, and architecture as a whole). This is symbolized using overlapping letterforms in the wordmark. The rounded shapes are meant to lend a familiar and approachable quality alongside the playfulness of the colours. Offsetting the colour is the word “architecture” in grey, a more-traditional colour that conjures solidity and professionalism. Online, this playfulness and the overlapping colour elements come together with large, full-screen images of the firm’s work. 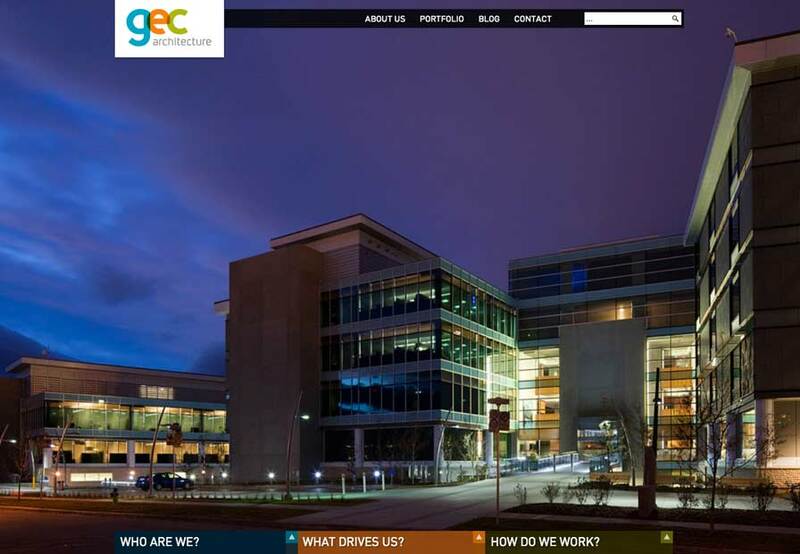 In the footer, the blue, orange, and green elements serve as content areas for expressing The GEC Way on the homepage, and particularly in the porfolio section where they are used to discretely showcase project descriptions, lists, and gallery pagination. 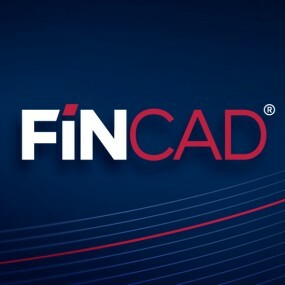 The rationale for the logo and the intersecting components were given a dynamic treatment as part of the user interface. Built on a Drupal platform, the site now gives the firm complete control of their own content for the first time, empowering them to keep things fresh. A blog will also help with internal culture and communications about what’s going on in the studio, and give potential and current clients and employees a deep look into the firm. We’ve said it before: we love working with architects. Turns out, the reason we do is the same reason so many others do not: they speak our language; they have opinions and often solid rationale to back them up. This project was no different, and it’s supremely satisfying to navigate a group of architect partners through a process such as this to a place where not only are they all extremely happy with the result, but also have successfully launched the new brand into their culture, with full staff buy-in. If the staff embraces the work, it’s a very good sign that clients and prospects will too. In fact, they have.